Startup Zipline is putting its second generation of drones through their paces at its test site in the foothills west of California’s Central Valley, a two-hour drive from Silicon Valley if you get really lucky with traffic. The company has shown off some of its technology before, but now it’s revealing its faster new drone models — they travel up to 80 mph, up from 68 mph — along with an upgraded delivery system that can handle 500 flights a day. It’s also offering a first look at how it snatches each drone out of the air when a journey has been completed. 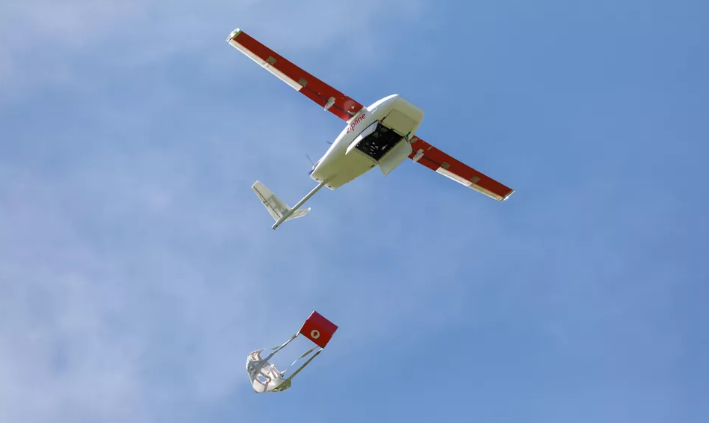 Amazon, Google, Walmart and others are experimenting with delivery drones, but Zipline is in business with the the diminutive aircraft already today, delivering blood from a drone launch base to hospitals in Rwanda. It’s almost done with a second launch site in Rwanda, it’s expanding to deliver vaccines and medicines, and it’s begun work to enable Tanzania operations, too. The delivery drones can deliver medical supplies quickly up to 50 miles away when roads are flooded or clinics are on an island. That’s why Zipline founder and engineering chief Keenan Wyrobek thinks the drones will come to the US, too. It’s still not clear what our drone delivery future holds. It could bring instant gratification to e-commerce and reduce greenhouse gas emissions. But it also would introduce new safety risks to aircraft and any of us underneath — especially in areas dense with people and drones. No wonder regulators are proceeding cautiously. Zipline has persuaded at least two governments, though, and Wyrobek thinks it’s got a chance in the US, too. Its drones can integrate with the existing air traffic control systems. And although today they follow preset courses and don’t have the ability to avoid things like aircraft or birds on their own, Zipline is working on adding those smarts. For now, the drones guide themselves to their destinations. Humans can intervene at the request of air traffic controllers if there’s a problem, but in Rwanda that’s not happened in its 7,000 flights. In the US, the Federal Aviation Administration has been cautious about approving drone operations, but Zipline is hopeful it’ll find a place to operate in the US. It’s part of eight proposals by various states and local governments to start drone delivery programs. Zipline’s drones may look like airplanes, but they don’t need runways. The company’s system involves three types of hardware: a fleet of drones, a track with an motor-wound cable to launch them, and a pair of towers with a cord to catch the drones when they return. The company has shown the drones and the launcher before, but now it’s got the catcher on display, too — something akin to the hook that human-piloted aircraft use to land on the ultra-short flight decks of aircraft carriers. The catcher relies on the aircraft to pilot itself toward home. When it’s on the right track, two poles flip up, and a cord strung between them flicks up to catch a tiny hook at the back of the drone’s tail. Once snared, the cord pays out to decelerate the drone, which swings down like a fish on a fishing line. A technician then unhooks it and removes its battery pack for charging. Zipline’s old system could launch about 50 drones a day, but the company has streamlined its aircraft and electronics setup to increase that to about 500 a day, Wyrobek said. The second-generation drones are now in use in Rwanda. They also have a better range, about 100 miles, up from 94 or so. How? For one thing, the drone’s electronic brain, communications and batteries are now integrated into one module. When Zipline gets an order — via text message — it takes about one or two minutes to send that destination to the electronics instead of 10 minutes with the earlier setup. Then, instead of requiring the assembly of multiple components, the single electronics module — about the size of a car battery, but much lighter — slots into the top of the drone. After that, an employee flips the drone up onto its nose to pack in the payload, then scans the setup with a smartphone that digitally associates the payload with the drone. There’s also a smartphone scan of a few QR codes on the aircraft that triggers quick tests that must be passed before the aircraft clears itself for another flight. Each drone is a lightweight plane built of modular components that can be swapped out — for example, the wing snaps off, and the motors that operate the flaps are designed so parts of the tail assembly can easily be changed in the field. The design is simpler, too, with just a few screws instead of 80. One battery pack charges while another is powering a flight. It takes about 2.5 batteries per plane to operate at 500 flights a day, with each flight lasting for up to 45 minutes. The payload itself can weigh about 4 pounds. It fits into a compartment about the size of a cake box on the belly of the drone, packed in by hand with a wax-paper parachute. The drone can drop it onto a patch of land about the size of two parking spaces, though Zipline hopes to improve to about half that, Wyrobek said. The drone’s air sensors gauge wind speed and direction so the little aircraft can compensate and drop the package more accurately. The parachute itself slows the package as it falls, but not that much. The payload is cushioned, and you shouldn’t expect Zipline to be sending wine glasses any time soon. Indeed, the company is focused solely on medical supplies at this stage — blood to start, and vaccines and prescription medicines next. Blood only goes to hospitals, but the other products will expand Zipline’s delivery services to clinics, too. Blood in particular has a short shelf life, and there’s rarely enough on hand. Zipline cuts waste that can plague blood delivery even in countries with developed roads. “We’ve virtually eliminated blood wastage,” Wyrobek said. In Rwanda, only three deliveries out of 7,000 were wasted, he said. The technology would work for other payloads, but the company isn’t pursuing that, which conveniently means it’s not directly challenging Amazon. Wyrobek speaks somewhat dismissively of delivering mere toothbrushes.